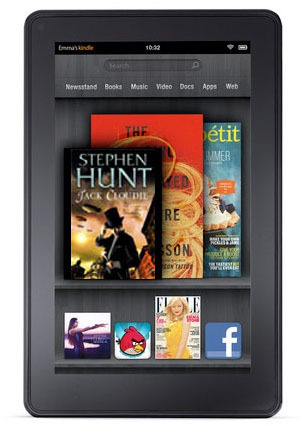 Here’s the new photo for Amazon’s new seven inch colour tablet, The Amazon Kindle Fire. It’ll be interesting to see how this handles e-books in practice – really, I suspect, this one’s forte will be apps, magazines and movies. CEO of Amzon, Jeff Bozos, also announced two new e-ink Kindles, including one at the magic sub-$99 price point. It’s available in Kindle dark grey and runs a heavily forked Android 2.3 operating system, although this isn’t very evident in the look and feel of the GUI, and sports a 7” LCD screen with a standard 1024×600 resolution (sorry e-ink fans) – which puts is more or less firmly up against the new Blackberry. The fork is for ‘user experience’ – e.g. 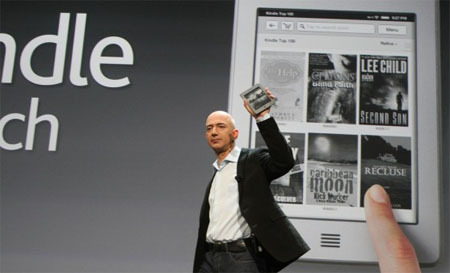 the Amazon’s Android Appstore, Kindle store, Amazon MP3, and Prime Instant Video which are all integrated into the O/S. Basically, it’s an Amazon shopping catalogue on demand in your pocket. WiFi is in-built, but sadly no microphone, camera or 3G connectivity, so Apple might not get too worried about the high-end customers. It’ll be available from November 2011 in the USA at $199 – but no UK availability yet. I’d be surprised if they don’t launch by Christmas here in Blighty. Barnes & Noble have been keeping their powder dry, and will be launching a new Nook Colour this Xmas, although again, not in the UK (&^%$$%^^&***). Taking the new Nook on will be a new $99 Kindle model launching called the Kindle Touch which is a totally buttonless Wi-Fi e-Ink reader – no keyboard – just a touchy feely interface (cough… iPad). This comes with an information overlay system called ‘XRay’, linking e-books’ text to Wikipedia data and other goodies. 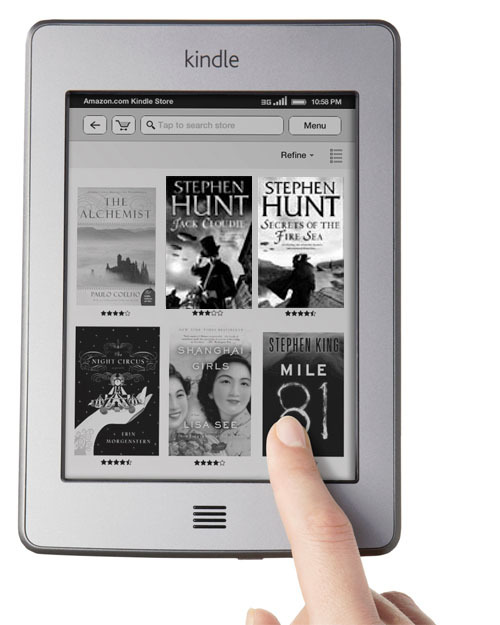 The ‘Kindle Touch 3G’ is a $150 modified version which will offer all-you-can-eat data with no fees. Hint… this is the one I want. Santa be good to me!